Online order entry and tracking - Select ONLINE ORDERING ! Port Lincoln to our Upper Spencer Gulf service to Whyalla, Port Augusta, Port Pirie and Crystal Brook. The announcement can be downloaded HERE. the Upper Spencer Gulf run to Whyalla, Port Augusta, Port Pirie and Crystal Brook. The announcement can be downloaded HERE . New rates apply from 1st September 2018. Please contact us if you haven't received them. The notification can be downloaded HERE (link fixed). Mildura depot moved 23 June 2018 to 3 Bothroyd Crt, Mildura VIC 3500. Berri depot new agent 6 June 2018 Rick Roissetter. Sprint Freight and Logistics have introduced online order entry and tracking. Started 29 August 2016. Existing customers can be emailed login details. See example HERE. New customers and those ordering for others need an account set up. Please complete and send us the APPLICATION. The Lochert Family have been supplying General, Refrigerated and Bulk Transport services to Waikerie, and the Riverland for three generations. To meet the growing needs of their customer base Sprint Freight and Logistics was introduced, which is a customer focused freight service offering an overnight express service throughout Adelaide, Riverland, Sunraysia, South East South Australia, and Western Victoria. Whether it’s a small parcel, right through to a full load, Sprint Freight and Logistics can get your freight moving. Sprint Freight and Logistics… Your local freight experts. 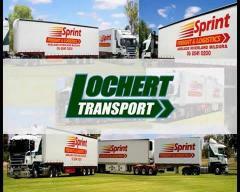 Lochert Transport has vast experience in freight solutions over many years, distributing freight around Australia and around the world. We understand that you, the customer don’t want problems you want solutions! You want the job done right the first time so that you can get on with your business. With our transport heritage in produce we understand that timeliness is of paramount importance and that at times production issues are not always predictable, this is why flexibility and communication is important in delivering service.